There’s Still Time To Book Your Holiday Party! Hey everyone! I wrote a little bit ago about offering a special thank you to all the local businesses for their support over the years. If you recall, I decided to discount all office Christmas parties by 10% if you booked the event by December 1st. I was pretty amazed and humbled by how many of our guests took me up on the deal! I have good news and bad news, though. Always the optimist, let me start with the good. There’s still time to book your year end work party. Up until the close of business on Saturday, November 30th, right after Thanksgiving and Black Friday, you can still receive a 10% discount off of your holiday party. If you’re the employee tasked with planning the event this year, you still have time schedule and receive a nice break on the price. 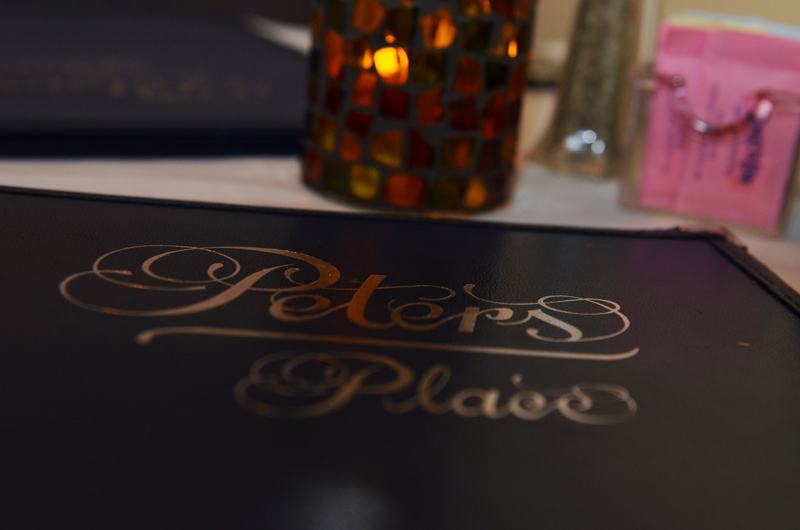 You can either call Peters Place at (412) 221-5000 or stop in and talk to us. 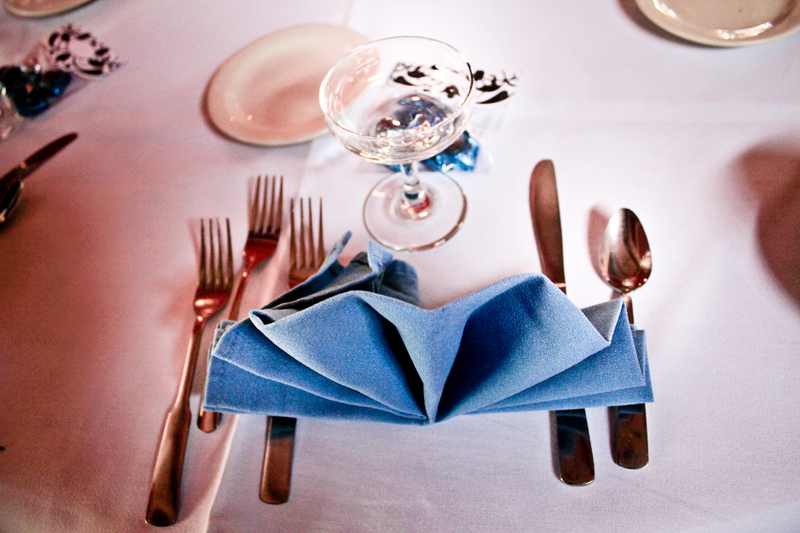 Just pick your date, you can let us help you with the details and menu later if you’re pressed for time. It doesn’t matter if your office includes 200 co workers, we can accommodate them! I’m trying not to be a Grinch here, but there is some bad news…..dates are filling up fast! I had no idea this “thank you” business promotion would take off the way it did! Don’t get me wrong, I love that so many employers in the area have chosen to host their holiday even here at Peters Place, but we’re running out of dates, with most of the “good” ones being booked already. There’s still slots left, but they won’t be for long! So, if you want all your coworkers to talk about how great the holiday party was this year, all year long, and you’re limited to the budget provided, you really need to give us a call right away! Feel free to preview our events menu here, and don’t hesitate any longer to pick your date! Remember, this special offer ends at the close of business on November 30th! Before I sat down here to write a new blog, I was considering writing a little bit about the History of Thanksgiving. Seems appropriate, right? I mean, after all, Thanksgiving is a pretty neat holiday centered around not only being grateful for everything a man has, but also involves a lot of food, which has always been one of my favorite topics. But then I realized something…..I was never really that interested in the history of anything! I mean, I liked history way back when, but I wasn’t what you’d call a serious student. Plus, every knows or has their own interpretation of Thanksgiving anyway, right? Pilgrims, Indians, planting maize, sharing in the harvest, teaching and helping each other. I would rather give a little history lesson about Peters Place, and how Thanksgiving has been celebrated here for nearly 30 years. I’m sure most of you know, but for those that don’t, Thanksgiving is the one day of the year when we pull out all the stops here at the restaurant. We’re open, which a lot of other places can’t say, but it’s much more than that. Honestly, I can’t remember the first year we decided to offer a huge Thanksgiving Day buffet, but it was awhile ago. I realized that although most people have large get togethers with their family, and there are plenty of folks who like to cook the bird on this day, there were also a pretty decent of those out there, well, that were either alone on this day or just didn’t want to prepare and host a huge feast. And don’t forget our desserts! Remember, we make these things from scratch, just like you do for your family gatherings! …..just to name a few. Yes, I’m very proud of the fact that Thanksgiving at Peters Place has become a family tradition for many of our valued guests. It’s great to see so many of the same families year after year decided to host their holiday meal here with us, but keep in mind, there’s always room for more! Ok, you want a sneak peek? How about this………only $23.95 per adult, Children 12 and under only $5.95 and Toddlers under 5 only $3.95. Seating is available from noon until 6:00pm. Now how can you beat that? Plus, there’s no cleaning dirty dishes, you don’t have to slave over a hot oven….wait! I’m giving away my best topics for the Top Ten article I mentioned! Want to read it? You can find it here. Give us a call at 412-221-5000 and let us know how many people will be in your party. Kathy and I will be here and we’re looking forward to seeing you and the entire family celebrate your Thanksgiving with us here at Peters Place. Hey friends, Mike here again with some thoughts on how much things have changed since we opened Peters Place back in 1984. 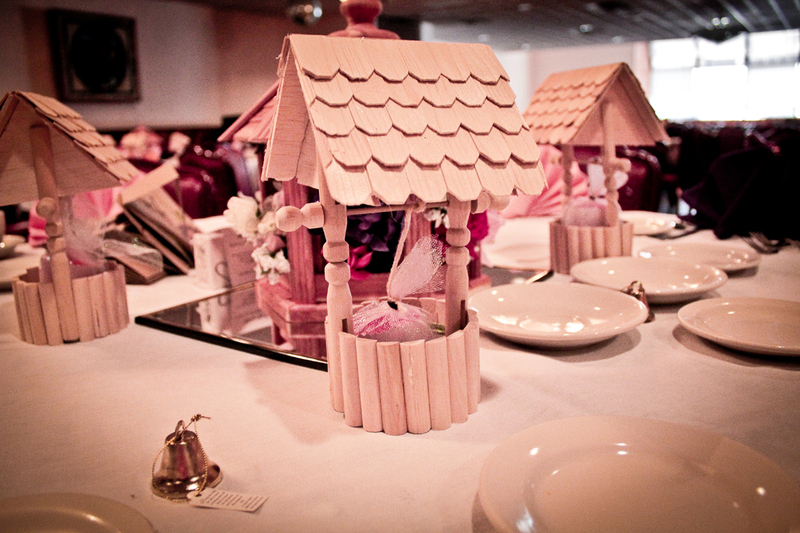 It used to be we would promote our wedding receptions, banquets and events in the Yellow Pages. Believe it or not, that was really the best option for any business thirty years ago. Now, with the internet, more people can find out about our services with just the click of a mouse. Wow, would anyone even know what “clicking a mouse” meant back then? It’s almost like those scenes in Back To Future when Marty McFly is in the diner asking for a Pepsi Free. For decades, we offered great perks and discounts for our guests when they provided their address….and I’m talking about a physical address….a place in the real world where the postman could deliver mail. I liked sending our friends special discounts on their birthdays and special dates like wedding anniversaries. In fact, being that I’ve just recently been dragged, kicking and screaming into the cyberspace world, it’s only been about a year since we transitioned into electronic versions of these greetings. I made a decision about a month or so ago to try to have the best of both worlds. We’ve implemented a new, physical sign up sheet to become part of our appreciated customer database. This sheet, available at the restaurant, not only asks for your email address (which I promise we will never sell, nothing worse than spam…..on a side note, when someone mentions spam I still can’t help picturing that awful “meat” in a can that we will never serve. That’s another promise you can write down! ), but also physical address and important dates. If you haven’t completed one of these forms yet, just stop in Peters Place and ask your server. Sure, I understand that everyone is used to clicking “open” rather than really opening mail, but, call me old fashioned, I still think there’s a place for real, written correspondence that you can hold in your hands. But, for those that prefer email, you can still check your in box for special offers. Those aren’t going away anytime soon! So, with all that being said, if you want to expedite getting in on all the special offers, you can either email (now that really sounds ironic!) your name & physical address to petersplacerest@aol.com or you can post a reply below to this article with the same information. Your address won’t be visible to the public and I will make sure they get added right away so you can begin to receive notification of our great deals. Plus, if you add your email address, I’ll get you in the email listings, too! Want To Know What’s Really Scary About October? Last time we talked it was all about Oktoberfest, which is really a fun time of year here at Peters Place, but I have to mention something else about October I just realized…..it’s really, really scary. I’m not talking about Halloween coming up at the end of the month (however we have a great event planned that I’m going to fill you in about early next week). The 31st is meant to be a fun kind of scary, you know, children dressed up in costumes, maybe catching a few thrillers like “Psycho” or “Night Of The Living Dead” on AMC, mother-in-laws paying unexpected visits; harmless type stuff. But I have to tell you what I saw just yesterday that literally stopped me in my tracks. Kathy and I were out at one of those big box retailers picking up some entertaining supplies for the Pirates’ game tonight (Go Bucs!). I literally stopped dead in the pop aisle, feeling my chin drop to my chest. “Mike, what’s wrong? You look pale. Are you ok?” You gotta love Kathy, that woman worries more about me that she does herself. “Take a look at that”, I said. Her eyes followed my trembling finger as it pointed to the biggest Christmas display I’ve ever seen. “Aww….those mechanical reindeer or adorable! Let’s buy a few!” Not the response I was anticipating. She took the buggy from my stiff hands and wheeled off towards these enormous, mechanical, garish reindeer that I knew would end up residing on my front lawn, if I could figure out to put the darn things together! Anyways, back to Kathy’s words of wisdom. We drove back to the restaurant and I checked the scheduling book surprised to notice that several of our regular business customers had already booked their parties, two of them even scheduled back in July! Now, normally the weekends are the most requested days to hold these corporate events, but this year I was thinking I could accommodate more holiday functions for local businesses if I really promoted weekdays, especially with a special offer. So here’s what I decided to do this year. 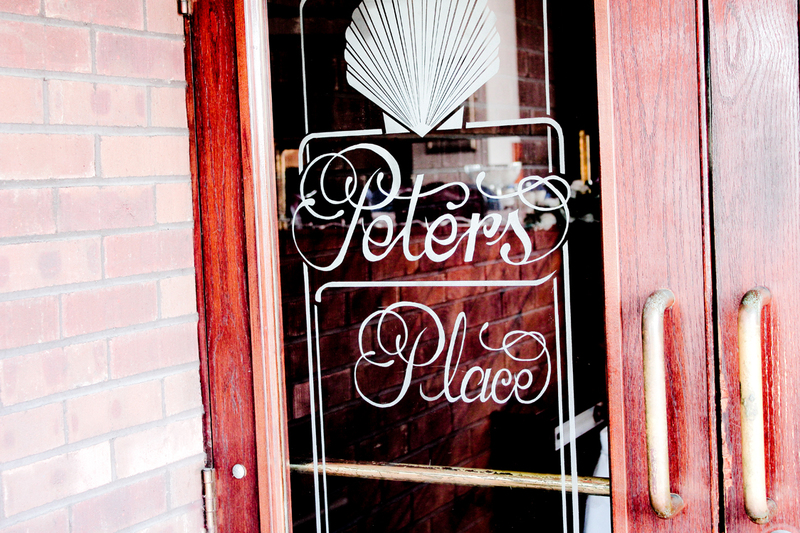 Even though space is filling up quick, (and it’s only the second week of October) I’m going to offer a discount of 10% to any local business that stops in and books their Holiday Party here at Peters Place before December 1st. I just want to be clear, your company can have the party any day available, just stop in and schedule your date by the first of December and I’ll throw in the 10% savings. That’s about a month and a half for those party planners who have been given the responsibility of finding a location for this year’s seasonal office gathering to look like a hero. You can find pricing and menus here, and you can always call me directly at the restaurant. If I’m not in due to wrestling with mechanical, lighted reindeer (you’re lucky I love you, Kathy! ), you can always ask for Josh, John or my brother Bill. Oh, what the heck! I’ll throw that 10% off even on the weekends, but only if you book by December 1st. After that, the phone always rings off the hook with requests and the best dates are already taken. I have to add, this offer isn’t valid with prior bookings or alcohol and I’m sorry, but I can’t combine this discount with any other offers. Now I have to start finalizing the big event for Hallow……caught myself! Check back next week for all those scary details, don’t want to let the black cat out of the bag just yet…..
Pittsburgh’s A Long Way From Germany…..Except During Oktoberfest! The brisk air, the crunch of fallen leaves under your feet, the sun setting a little earlier. These changes can mean only one thing….Autumn has arrived. Now some of my readers out there will complain that this means Summer is over and we’ll all need to brace for cold winter. Well, yeah, I guess so. Then there are those who will relish in the fact that football season is in full swing, but if you’re like anything like me you’re not as thrilled about our Steelers as you were in the past, so that doesn’t really bring any comfort. Hey, while we’re on the subject of sports, how ’bout them Pirates, huh? Ok, cold weather, dark before the time Alex Trebek reads Final Jeopardy and football seems to be a bust. But you know what? I’m still pretty darn happy. Why? I thought you’d never ask! OKTOBERFEST HAS ARRIVED! Yes, I know it’s the final days of September, but we’ve always started our Oktoberfest celebrations just a little bit early here at Peters Place because it’s so much fun! Every year we bring in the best German beers, break out our lederhosen and throw some mischief into the menu. Our guests have come to expect some really European dishes and this year I think we may have outdone ourselves. *How about some Brandenburg Lamb Stew? Some of the most tender lamb you will ever have, cubed and stewed with sliced onions, green beans, brown gravy and mustard sauce. *Kathy’s favorite is the German Sirloin, consisting of a nice filet broiled with a Jagermeister mushroom bourbon sauce served over spatzle. Excuse me? You don’t know what spatzle is? Then you really have to get in here and try some! *Saurbraten is really popular with the regulars. Imagine thinly sliced oven roasted sirloin marinated in vinegar brine, finished with a sweet and sour glaze. I didn’t even mention the Bavarian sauerkraut and mashed potatoes that comes with it. You’ll be lucky if you have any room left for dessert. Did I say dessert? Yes I did! How about some Apple Strudel or Pumpkin Pie? For you chocolate lovers, nothing can compare to our German Chocolate Cake. So, why not make some plans to stop in and try a little taste of Germany? Oh, and if that whole image of me in lederhosen scares you, I was only joking! As all of my faithful readers know, I really love being the owner of Peters Place. After 30 years you would think I’ve had my fill of the restaurant industry, but everyday I find myself learning something new. Writing this blog is a perfect example. One of my favorite duties, however, has always been showing our reception rooms to recently engaged brides. There’s something about their energy as they begin the search for that perfect venue that keeps me young. Earlier this week I had the pleasure to meet Amy. This girl was cute as a button and could hardly contain her excitement as she spoke about her fiance and their upcoming wedding. As is often the case, her mother, Shirley, accompanied her. I have to admit, I was surprised with how detailed both of their questions were. They seemed to ask me everything imaginable, from how loud the music could be to what cab companies serviced Bridgeville. As we sat down in the lounge to discuss the paperwork I had to commend them on their due diligence. Shirley explained that we weren’t the first venue they explored for the big event. In fact, they had visited a grand total of 18 banquet and reception halls over the course of the past month. With a smile on her face, she signed the forms and handed the pen to Amy so she could also place her signature. I have to admit I thought twice about summarizing her reasons here on the blog, but both Shirley and Amy thought it would be a valuable time saver for other brides-to-be. Listed below are their reasons for hosting the big day with. Now, keep in mind, there is no way I’m going to mention those places by name, it’s never been my style to say anything negative about my fellow restaurant owners. It’s not only unethical, but it breaks the unspoken code amongst us. Keeping that in mind, I’m going to use the words “Other Places” referring to just that, locations that aren’t Peters Place. This doesn’t mean every event location adheres to the following polices, but if you do you’re research like Amy and Shirley, you’ll be able to come to your own conclusions. More than one of the Other Places charge additional fees not only for the cocktail hour (you know, that period of time when all the guests are waiting around for the wedding party to arrive), but also charge up to $2.00 a pop just for uncorking a bottle of champagne! Yes, that’s for every bottle….literally just taking off the foil and popping the cork. Plus, even with a open bar, one location charges for straight shots. 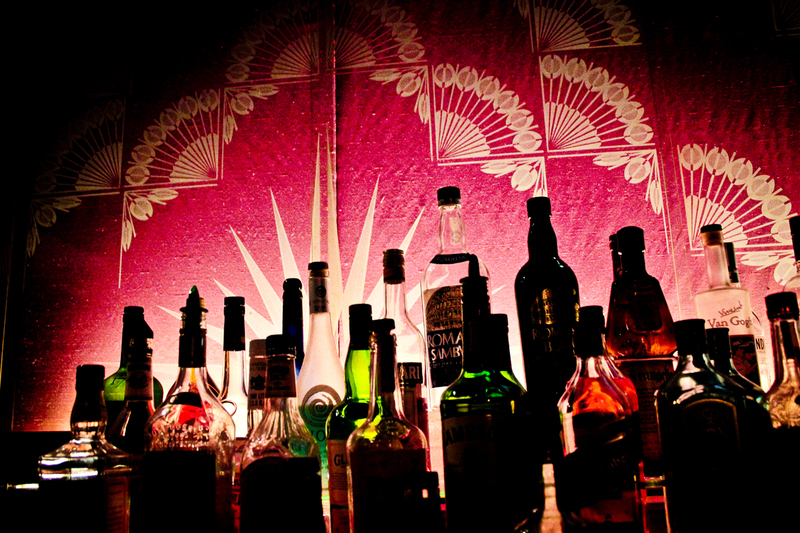 We’ve always offered various pricing for our bar service, but the most popular has always been the open bar. I’ve always been up front with my guests, so I’m going to detail our most expensive option when it comes to alcohol. Our premium brands start at $8.00 per guest for the first hour, then slides down to as low as $4.00 as the event proceeds. And that includes that first hour. It’s easy to do the math, one drink in the city can cost almost $8.00! And this business about charging to open a bottle of champagne? Forget that nonsense. We offer a champagne toast for all of your guest, and I would be embarrassed to charge anything just for opening a bottle. By the way: a shot is a shot. The liquor comes out of the same bottle whether it’s going into a highball glass or not. Sorry, but I don’t get how some venues don’t see it that way. I understand the concept that the venue needs to have a head count, I mean, how else can they know how much food to prepare, but the gap between pricing and quantity has to be realistic. According to Amy there was one venue across town that required a minimum of 150 people and wouldn’t offer a per plate discount until the guest count reached 225. Add to that, Shirley claims a good half of these locations wanted their money paid up front, a full 10 days before the reception! It’s been my experience that any business that doesn’t offer reasonable food packages on a realistic sliding scale are simply trying to gouge the customer. We offer customized packages including sit down meals and the always popular buffet option as well as four packages to choose from starting at $29.99 per guest. And as far as collecting money up front? Short of the standard deposit, we don’t expect payment until the end of the event. It’s all right here on our website. This subject is almost as ridiculous at the uncorking fee! 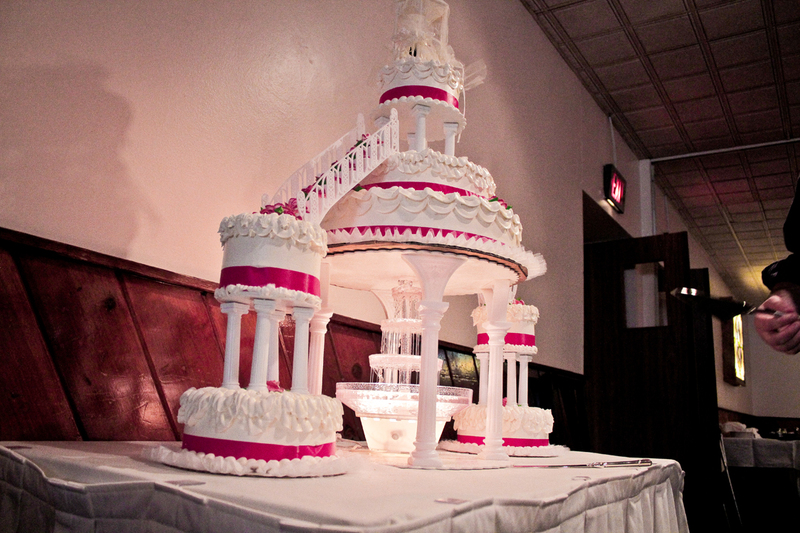 Up to $3.00 per guest just to cut and serve the wedding cake? Seriously, folks, I’m not making this up. Here’s the deal, I’ve never really put much thought into, but our cake cutting is complimentary. As long as I’m still breathing it always will be! Also, this seems like the proper place to mention that your wedding cake is included in the price. Graham’s Bakery in Castle Shannon offers a selection of cakes to choose from and these things not only taste amazing, they’re really something to see. Make sure before you sign any paperwork that you ask if you can use your vendors for flowers, decorations, even entertainment. A few of these locations require that you use their partners for some of these services. It’s totally up to you! Chances are whoever you select they’ve done their share of work at one of our hosted receptions. As an added bonus, if you’re looking to save some money on these services we can recommend florists, printers, limousine services, all at a discount. I’ve been around so long I could probably even drum up an ordained minister or Justice of The Peace to perform the ceremony! Depending on the size of your reception, parking can be a problem at some venues. There’s even a handful of places that charge your guests to park their car at your reception. No matter how large your event is, we have enough parking to accommodate everyone comfortably. We’ve never charged for parking or had a valet service, but you have to ask yourself, is that really a necessity? Most banquet halls will let you know how much tax and gratuity is required to hold your event, even if it’s in the fine print. Make sure you know this ahead of time! The last thing your reception budget needs is to discover you didn’t account for this. This is probably a good place to add that some locations charge a room fee on top of the food and alcohol price. It’s wise to ask up front if there’s any extra billing for use of the space. Any business owner needs to charge tax for their product, and we’re no different. Gratuity is detailed here on our site. As for a room fee, nope, doesn’t exist here. The prices quoted are the prices charged with no premium just to use one of our four spacious rooms. I thanked Shirley and Amy for sharing these insights with me and agreed that I would share their findings with my readers. They left and I went upstairs to finish some accumulated paperwork, but my thoughts kept going back this earlier conversation. There were benefits that we’ve offered forever that weren’t even discussed, like specific allergy and dietary needs, special requests and theme weddings…..maybe I’ll save those details for the next blog. Can An Old Dog Learn About Review Sites? Mary, one of our most loyal customers here at Peters Place, called me over to her booth for a chat last week. She’s around my age, but time has been much kinder to her, that’s for sure. I can’t quite remember how, but the conversation turned towards online reviews sites, something I never really looked into. I’m an old dog, just recently learning my way around the online world, but Mary, surprisingly she’s a pro. Listening to her talk I’ll bet she knows more about Facebook, Twitter and Tumblr than my teenage grand daughter. She really got my attention when she mentioned Urbanspoon.com, the online leader as far as restaurant reviews are concerned. Being a restaurant owner, of course I’ve heard of Urbanspoon, but I must admit I didn’t know the ins and outs of how it worked. Mary gave me a crash course on several internet sites as Tony, her husband, sat their rolling his eyes. I was pleased to hear Mary convey all the complimentary comments she read, but of course, sweetheart that she is, I knew she would sugarcoat any negative reviews. She and Tony finished their coffee and dessert as we said our goodbyes. I couldn’t wait to get up to the office to see the reviews for myself. Actually, for the most part, Mary was right. The majority of our guests really do enjoy dining and holding their events with us. It wasn’t all peaches ‘n cream, though. There were a few not so glamorous comments, not many, but there they were. I spent the rest of the day reading all the comments on Urbanspoon and, with a little assistance from my grand daughter, learned how to interact online with these guests. There’s an old saying that you can’t please everyone all of the time. I never agreed with that mindset. Thirty plus years on in this business I still don’t. Our goal is to make sure everyone who visits enjoys their experience. I don’t care if it’s a bridal party of 300 people or even Andy who stops in the lounge for a drink. We’re nothing here without the support of our guests. I don’t want anyone reading this to think that comments and reviews are something new. I’ve always requested feedback via our email of info@petersplacerestaurant.net, and the phone number has been 412-221-5000 since we’ve opened the doors, but it seems the trend these days is to post feedback online. We like to hear when our guests are happy. Enjoyed your experience? Tell us on Urbanspoon. Have a suggestion on how we can improve? Let us know! I do have to admit, I’m more comfortable interacting with guests in person, but I’m always willing to learn something new. Thanks for all those kind words out in cyberspace. Take Her Out For $30? I’m married to a wonderful lady, and like most men, I want to treat her to some of the nicer things in life. You have to keep ’em happy, right? Well, the sad truth is, it can get expensive. Don’t get me wrong, she’s worth every penny I’ve ever spent on her, multiplied by infinity. (Hope you’re reading this, Kathy!) Depending on where you take her, and how often you take her out, it can get pricey. We both love the restaurant, but we’re here all the time. Yes, we do go out to eat elsewhere on occasion, and it wouldn’t be truthful if I said I always thought the pricing was fair. I know the cost of a meal isn’t always a factor in a night out. I’ve always been aware of the importance of portion size, service and setting. I like to think I’ve done a pretty job offering all of the above. A few weeks ago we were visiting some friends in a neighboring state. The group decided to go out for dinner at a local restaurant, one of their favorites. I’m always up for seeing how my fellow restaurant owners operate, so off we went. This particular establishment was running a special: 2 dinners for $45.00. Sounded good to me. Each couple took advantage of the promotion, but I have to tell you, there wasn’t much of a selection. Don’t get me wrong, the food was really good, I just wish we had more options. I should mention that we also we ordered appetizers which were extra, but nothing is too good for my girl! When we got back to Pittsburgh I took a close look at our menu. I could do this….I should do this…..I’m going to do, but I’m going to do it better! That was the origin of our new 2 For $30 special. Yes, that’s right, I was able to offer a wider selection and for $15.00 less. Not only that, but I could even give my guests the choice of an appetizer included in the price. So, to my fellow men out there, you can’t use money as an excuse to take your lady out for a nice dinner. Don’t believe me? Check it out here, and when you do stop in just, give me that wink that you read this post. She doesn’t have to know how much you spent, right? What Item Have We Served To More Guests Than Any Other? One of the best things about being at the restaurant every day for nearly thirty years is that I’ve gotten to know a lot of our guests personally. I love seeing our regulars come in and when I can, I like to sit down with them and catch up on things. Needless to say I was impressed and flattered at the same time. I had to ask my most loyal guests “I’ll bet you’ve tried everything we’ve ever had on the menu!” Now this is where I was really shocked. I knew before they told me. The Seafood Bisque. I’m proud of everything we serve, but I have to admit, if I had to pick one tried and true menu item that has come to define the restaurant, our bread and butter if you will, it has to be the Bisque. Every restaurant has it’s signature item, whether it’s a special steak, a pasta dish, or a family chicken recipe. Even the golden arches has that big sandwich with two patties, special sauce….you know what I mean! Now, I’m not going to give away the recipe, but I will tell you this, I’ve been preparing this specialty for decades…..myself. I knew it was good when it appeared on our very first menu, but I honestly didn’t have any idea it would take off like it did, having this kind of staying power. I’ll bet there’s been days when we sold more Bisque than beer! This got to me wonder. Being that I make it myself, I know I sell on average forty gallons a week. How many gallons have I prepared over the last thirty years?? (answer below). I’m a pretty humble guy, but I have to admit, if you’ve tried our Seafood Bisque, you have no idea what you’re missing. Next time you’re in I highly recommend you order it as one of your sides. Chances are you will agree with Mr. & Mrs. Loyal Customer mentioned earlier, and you just may find you have a new favorite specialty that you can only get here at Peters Place. Answer: 62,400 Gallons Of Seafood Bisque!